A professional summary is a brief summary of your skills, experiences and goals directly relating to the job posting. It is a summary about you but with regards to your professional life. It is also sometimes called a qualifications summary, professional summary, resume profile, or a resume summary statement. The main goal of a professional summary is to make your most relatable skills and experience immediately capture the hiring managers attention and make him/her qualify you for the job. It is different from that of an resume objective. 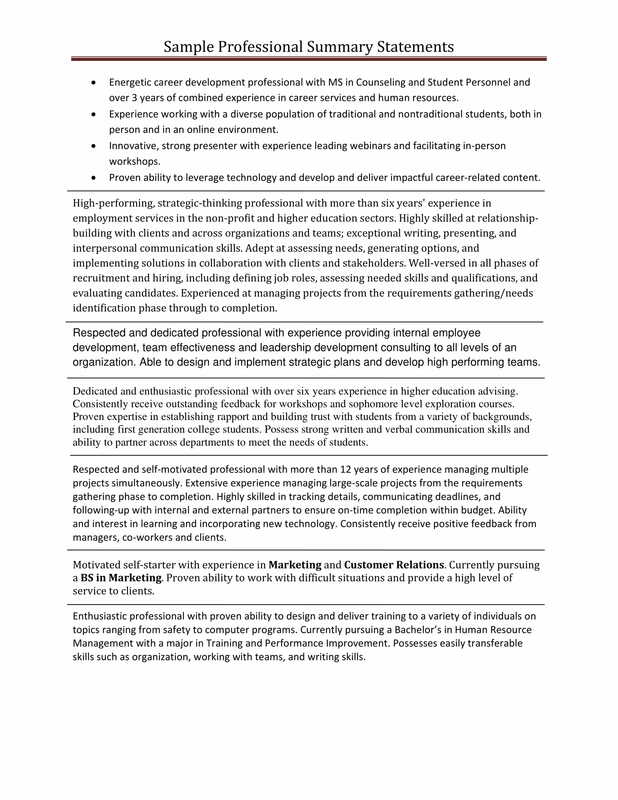 Unlike a professional summary that focuses on relevant skills and experiences, the resume objective is just a list of your goals specifically designed for students, fresh graduates or people changing careers with no relevant experience to the job. Why Include a Professional Summary? Always think about the hiring manager’s perspective when writing your resume. This will help you better understand and sort through the information you need to include in your resume. In every job posting, the set of skills and qualifications are listed so applicants with the needed skills are more encouraged to send in a resume. Your relevant skills should be in the forefront of your resume so that employers can become more interested in your general application. This will give them a reason to read every detail in your resume. Find the most important keyword indicated in the job listing. Integrate it with the skills, experiences and other credentials that you already have. Bullet points will be your best friend. when you need to structure your text clearly without giving it too much effort, use bullet points. Not only does it help in your organization, it also makes your resume easy on the eyes of the hiring manager. Although remember to list your current job title first and put it in bold. You may also check out what should be in an executive summary of a report? Having a long summary defeats the purpose of it being a “summary.” Make sure it is not longer than five short sentences or bullet points. In conclusion, a professional summary is a vital part that you should include in your resume. It can help you immediately capture the hiring manager’s attention and help you avoid having your resume discarded. It is important to learn the basics on how to write an effective professional summary, we hope this article serves as a guide for your professional summary writing.